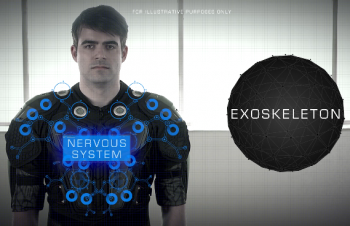 ARAIG Gaming Suit is "As Real as it Gets"
First VR headsets, then omni-directional treadmills, now wearable computing. Is the Matrix right around the corner? "Experience the next level of gaming. Finally you get to feel what you've only been able to see." This is the mission statement for IFTech's bold new piece of gaming hardware: a "suit" of wearable computing dubbed "As Real as it Gets (ARAIG)". Silly acronym aside, ARAIG uses several forms of feedback to give players the experience of actually being inside the game. "It is wearable technology that stimulates the senses where you, the gamer, can now feel the rain on your shoulders, the rumble of a tank, the concussion of sound and debris, where you are drowned in the sensations and sound of your gaming world," promises IFTech on its Kickstarter page, where it is asking for $900,000 to fund the project. ARAIG uses 3 forms of sensory feedback: surround sound, vibration and STIMS. Surround sound is pretty straightforward: speakers built into the device itself let the user hear sounds as if they were actually in the game. Vibration is pretty much standard controller vibration, but over your whole body and much more concise (the developer gives the example of "a high powered sniper rifle might create a very strong impact at one location while a plasma rifle might create an average impact at a particular location and then spread out across the body." STIMS is the really unique aspect of the ARAIG device, using sensory stimulation "to contract particular muscles". The initial design focuses on the pectorals and abdominal muscles, and can create everything from a tingling sensation as if something is crawling across the skin, to a full out contraction of the muscle to move your body. If you're worried that this might be beyond your pain threshold, IFTech assures us that the ARAIG is FDA approved and does not cause any pain to the user. Probably the coolest thing about this technology is thinking about how it would interact with both the Oculus Rift and the Omni treadmill, to create the most immersive possible VR environment. Ladies and gentlemen, could this be the "true" VR that we've so far only ever seen in movies? Excuse me while I put on all three pieces of technology and essentially become Batman in time for Arkham Origins.